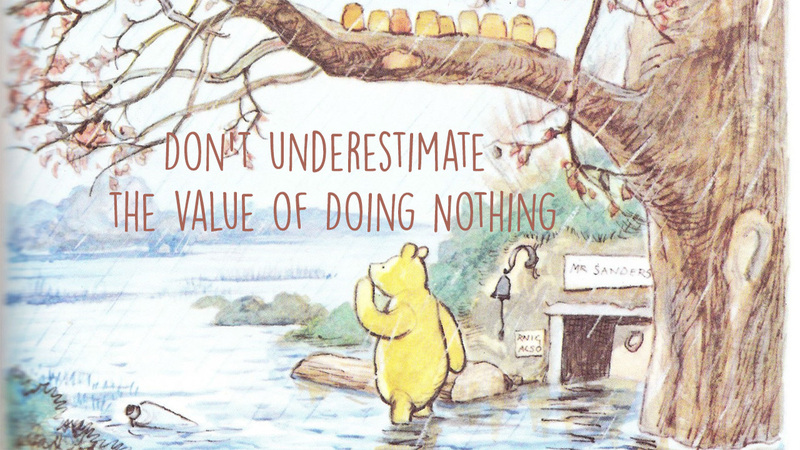 And definitely don’t underestimate the value of listening to Pooh! “Where are we going?” said Pooh, hurrying after him, and wondering whether it was to be an Explore or a What-shall-I-do-about-you-know-what. Many people are afraid of Emptiness, however, because it reminds them of Loneliness. Everything has to be filled in, it seems-appointment books, hillsides, vacant lots—but when all the spaces are filled the Loneliness really begins. Then the Groups are joined, the Classes are signed up for, and the Gift-to-Yourself items are bought. When the Loneliness starts creeping in the door, the Television Set is turned on to make it go away. But it doesn’t going away. some of us do instead, and after discarding the emptiness of the Big Congested Mess, we discover the Fullness of Nothing. One of our favorite examples of the value of Nothing is an incident in the life of the Japanese emperor Hirohito. Now, being emperor in one of the most frantically Confucianist countries in the world is not necessarily all that relaxing. From early morning until late at night, practically every minute of the emperor’s time is filled in with meetings, audiences, tours, inspections, and who-knows-what. And through a day so tightly scheduled that it would make a stone wall seem open by comparison, the emperor must glide, like a great ship sailing in a steady breeze. In the middle of a particularly busy day, the emperor was driven to a meeting hall for an appointment of some kind. But when he arrived, there was no one there. The emperor walked into the middle of the great hall, stood silently for a moment, then bowed to the empty space. He turned to his assistants, a large smile on his face. “We must schedule more appointments like this,” he told them. Let’s say you get an idea—or, as Pooh would more accurately say, it gets you. Where did it come from? From this something, which came from that something? If you are able to trace it all the way back to its source, you will discover that it came from Nothing. And chances are, the greater the idea, the more directly it came from there. “A stroke of genius! Completely unheard of! A revolutionary new approach!” Practically everyone has gotten some sort of an idea like that sometime, most likely after a sound sleep when everything was so clear and filled with Nothing that an Idea suddenly appeared in it. but we don’t have to fall asleep for a few hours for that to happen. We can be awake,instead—completely awake. The process is very natural. It starts when we are children, helpless but aware of things, enjoying what is around us. Then we reach adolescence, still helpless but trying to at least appear independent. When we outgrow that stage, we become adults—self-sufficient individuals able and mature enough to help others as we have learned to help ourselves. But the adult is not the highest stage of development. the end of the cycle is that of the independent, clear-minded, all-seeing Child. That is the level known as wisdom. When the Tao Te Ching and other wise books say things like, “return to the beginning, become a child again,” that’s what they’re referring to. Why do the enlightened seem filled with light and happiness, like children? Why do they sometimes even look and talk children? Because they are. The wise are Children Who Know. Their minds have been emptied of the countless minute something of small learning, and filled with wisdom of the Great Nothing, the Way of the Universe. They walked on thinking of This and That, and by-and-by they came to an enchanted place on the very top of the Forest called Galleons Lap, which is sixty-something trees in a circle; and Christopher Robin knew that it was enchanted because nobody had ever been able to count whether it was sixty-three or sixty-four, not even when he tied a piece of string round each tree after he had counted it. Being enchanted, its floor was not like the floor of the Forest, gorse and bracken and heather, but close-set grass, quiet and smooth and green. … Sitting there they could see the whole world spread out until it reached the sky, and whatever there was all the world over was with them in Galleons Lap. There the Pooh books come to an end, in the Enchanted Place at the top of the Forest. We can go there at any time. It’s not far away;it’s not hard to find. Just take the path to Nothing, and go Nowhere until you reach it. Because the Enchanted Place is right where you are, and if you’re Friendly With Bears, you can find it.